Here are two more Lynnderella shades that readers wanted to see! I'm making my way through the requests, so if you haven't seen yours yet, it will be up in the next couple of days. 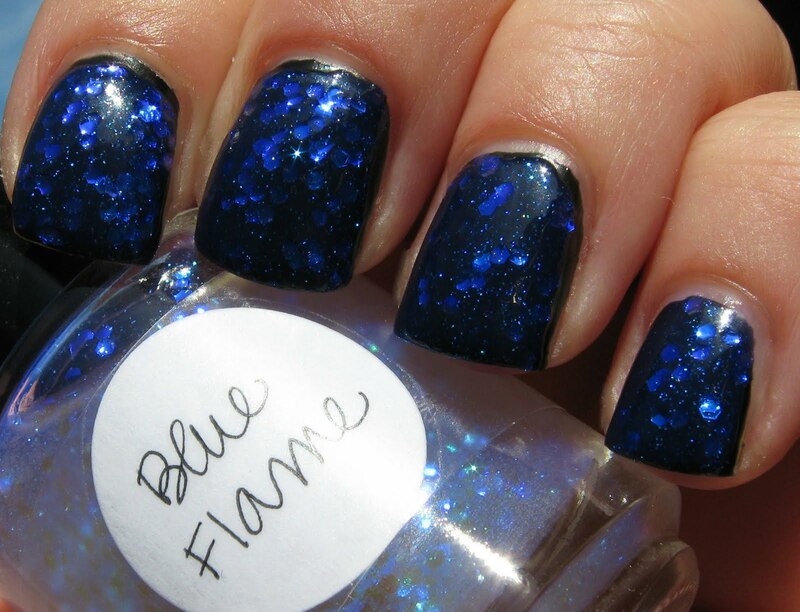 Blue Flame is an interesting shade which I think was designed to be used as a top coat over just about any shade. It's a milky base that's filled with pale violet iridescent micro glitter...or so I thought. The first stroke (shown here over a black creme) revealed larger hex glitter that I didn't see in the bottle. Upon closer inspection, there is the palest of gold--almost see-through--hex glitter in the mix as well. 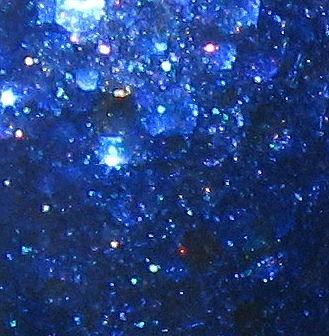 It all combines on the nail to become a glowing bright blue maze of glitters. Here's a photo taken in the shade, and the hex glitter becomes more foil-like. I did put this shade over a pale yellow that I have on my toes to see what color a lighter base would turn the glitters, and they are a very pale lilac. 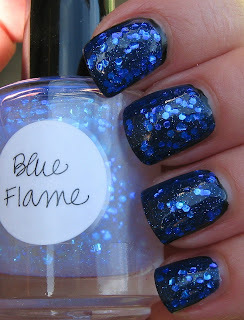 I'll have to do a nail wheel using random colors to see just what else Blue Flame can do! 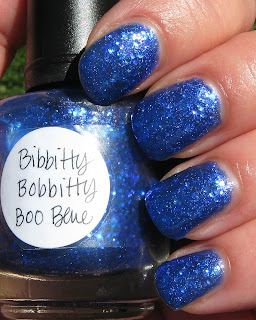 Bibbitty Bobbitty Boo Blue...try to say that fast a couple of times! This shade looks quite purple in the bottle, because it has a massive amount of purple micro glitter mixed in with the larger foil blue hex glitter. This shade appears to have a greyed-out dusty violet colored base, and I used three coats for opaque coverage. Once applied, it becomes a violet blue shade that leans more blue. I have a hard time describing some of the Lynnderella polishes, because there are so many colors and shapes in them! 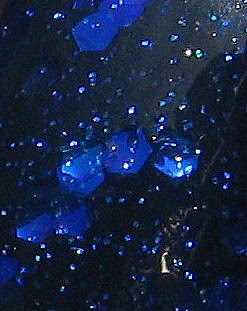 Many of the glitters are iridescent, so they change color in different lighting and with movement. Never having tried to re-create one of her polishes, I can certainly see why it has been difficult for those who have tried, with no luck. What she puts in these, I have no idea, because I see something different every time I look at them. I wonder what Blue Flame would look like oer a light pink :) looks cute! Blue Flame is pretty great.